Unmatched 12W SuperBoom Output using Twin high-excursion Drivers and a Passive Radiator for a Springy Bass makes this more powerful than you could imagine. 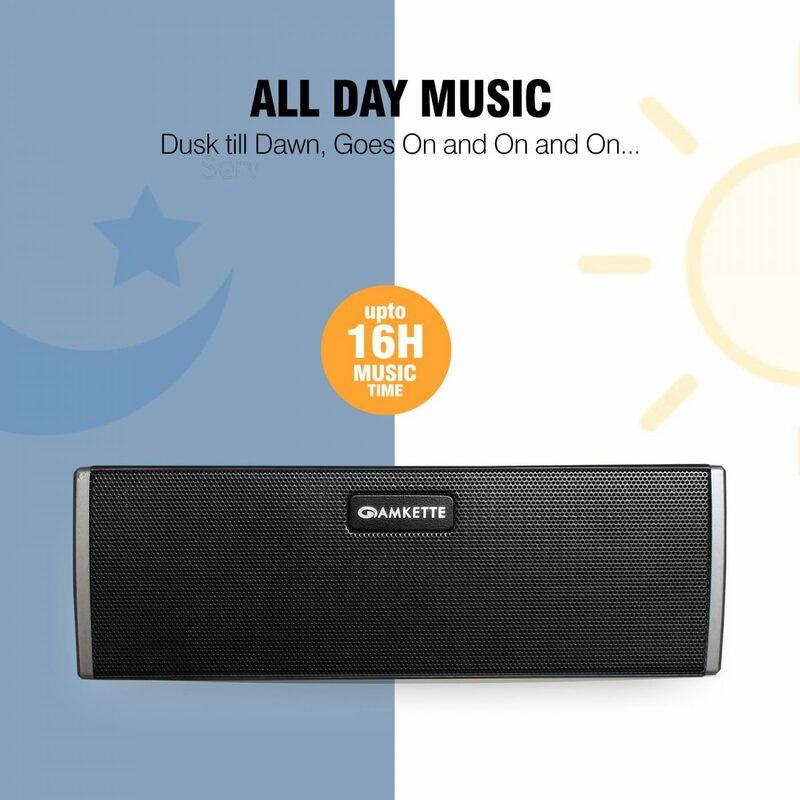 A built-in 4000mAh stellar battery life for 16 Hours of NonStop playback on a single charge, so you can listen for longer with no worry to charge. 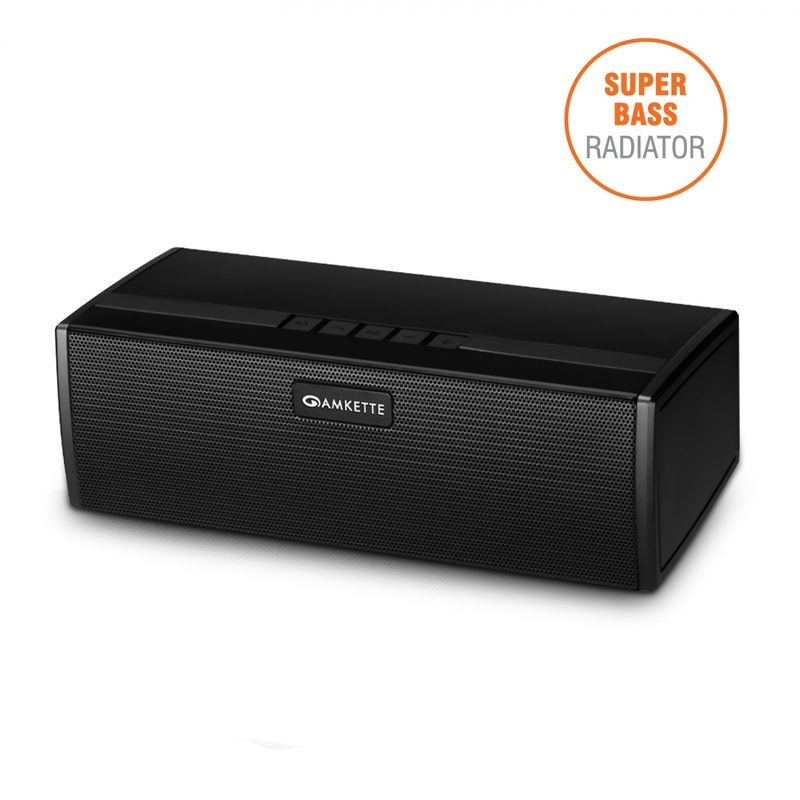 A Premium Metallic Finish and an Acoustically optimized design that reduces vibrations and increases audio fidelity with chunky bass, punchy beats and lovely,clear vocals.You will buy it for the look, but love it for the sound. 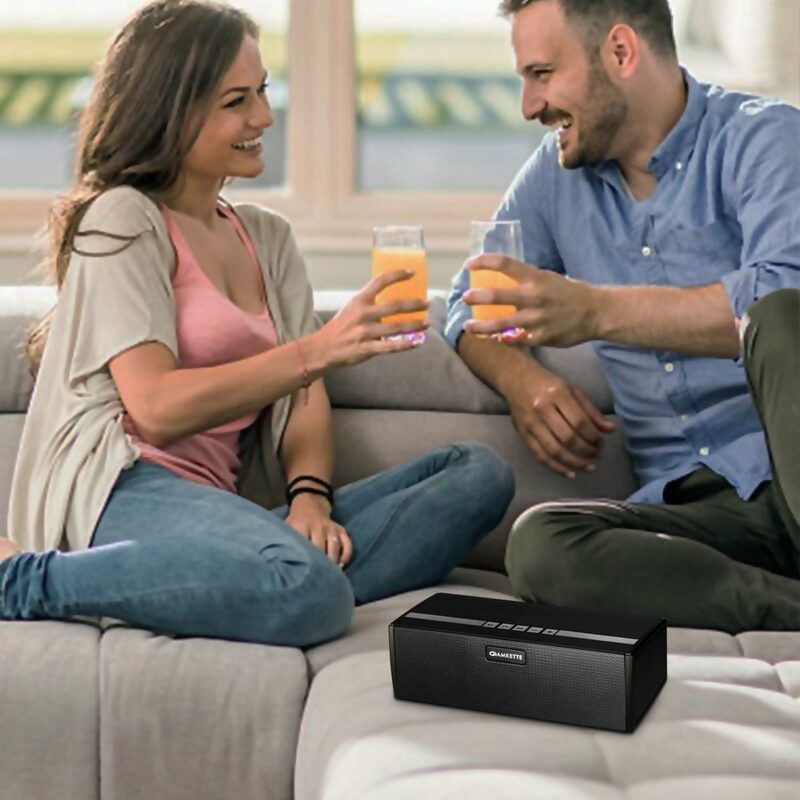 Partylovers and the movie buffs will love how the BoomerFx lets you play music via Bluetooth/AUX/USB/FM and SD cards.Plus, with BoomerFx Power-bank functionality, you can listen to tunes and keep your phone juiced at the same time. 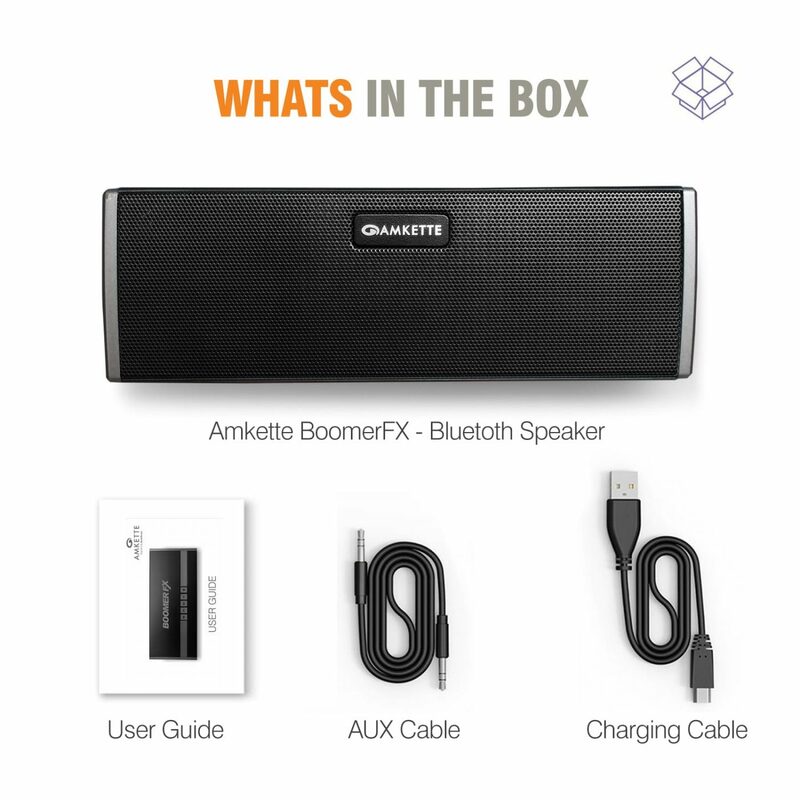 Amkette Trubeats BoomerFX is the current Bluetooth Speaker King, offering the big booming sound quality. 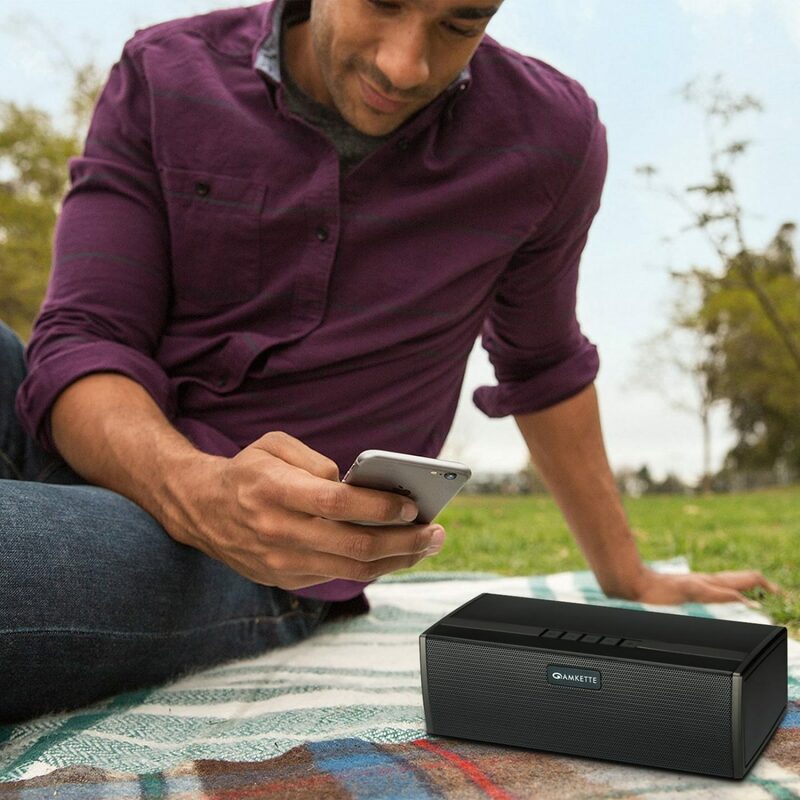 The BoomerFx is built to deliver 16 hours of booming tunes on a single charge. On top of delivering rich bass and incredible battery backup, the BoomerFx features an attractive Premium Metallic finish design that simply adds royalty to your room. It’s not just a pretty face; it’s practical too. 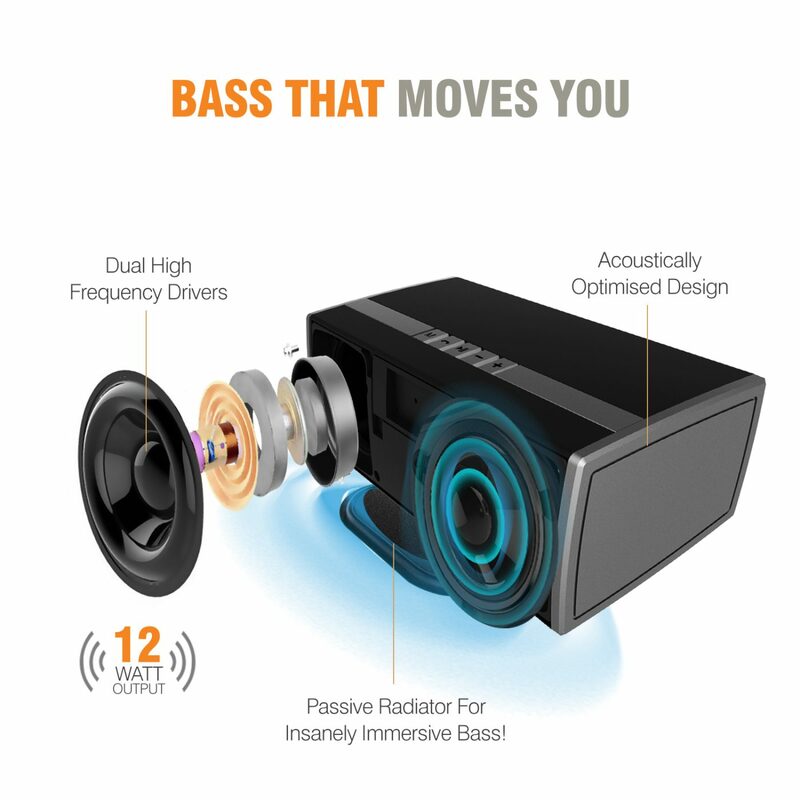 Inside the BoomerFx are two active 52mm drivers and one passive radiator for springy bass to creates the ultimate stereo speaker experience .Plus, with BoomerFx Power-bank functionality, you can listen to tunes and keep your phone juiced at the same time. 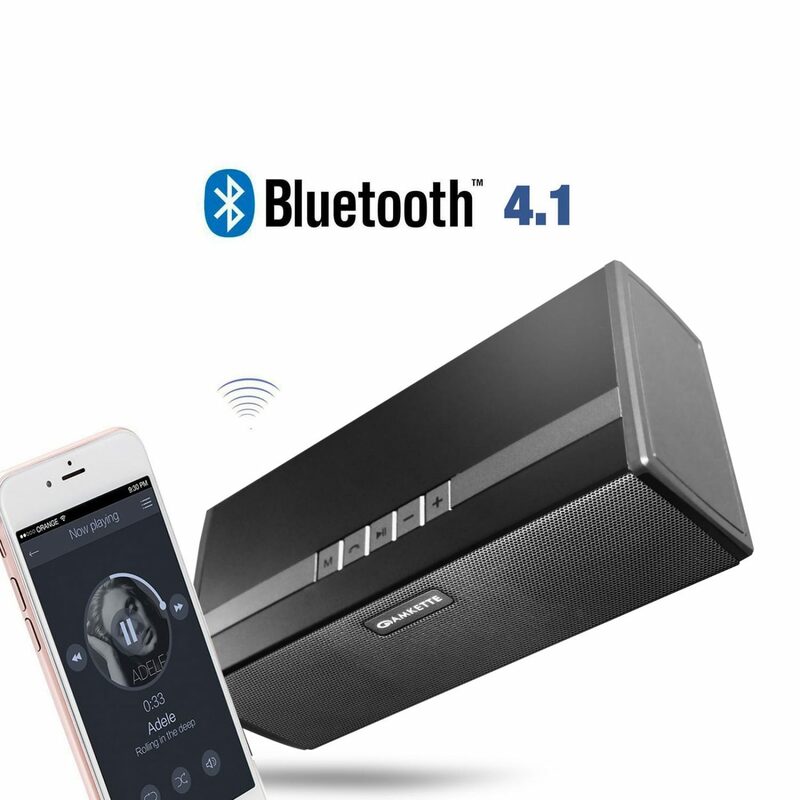 To sum it up if you want a Premium Bluetooth speaker that looks as good as it sounds and lasts long, the BoomerFx is for you. It’s time to SUPERBOOM! 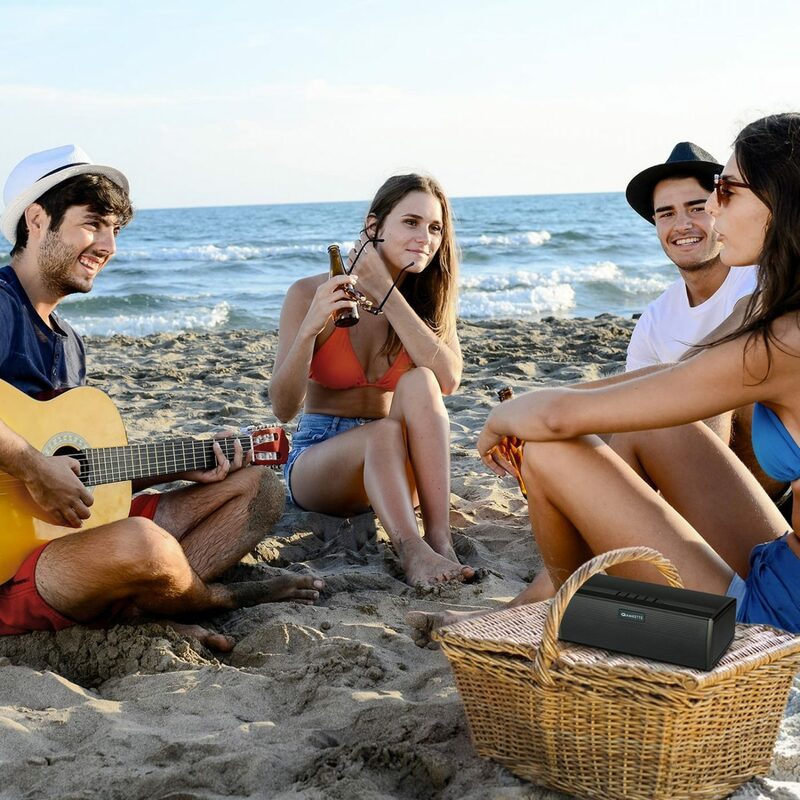 With the Bluetooth wireless connection, connect your smartphone with the BoomerFx to Pair and Play music anywhere. Out of charge? Not a problem with Boomer Fx’s Giant built in battery that ensures over 16 Hours of Non Stop playback on a single charge. So don’t stop dancing just yet. A Premium Metallic Finish and an Acoustically optimized design that reduces vibrations and increases audio fidelity with springy bass, punchy beats and crystal clear vocals. You may buy it for the looks, but will love it for the sound. Can we attend calls using this Speaker? Yes, BoomerFX has inbuilt Mic for attending calls. Does this speaker has FM functionality? Yes, you need to use Micro USB cable as an antenna for FM to work. Can I connect it to my Laptop/PC? 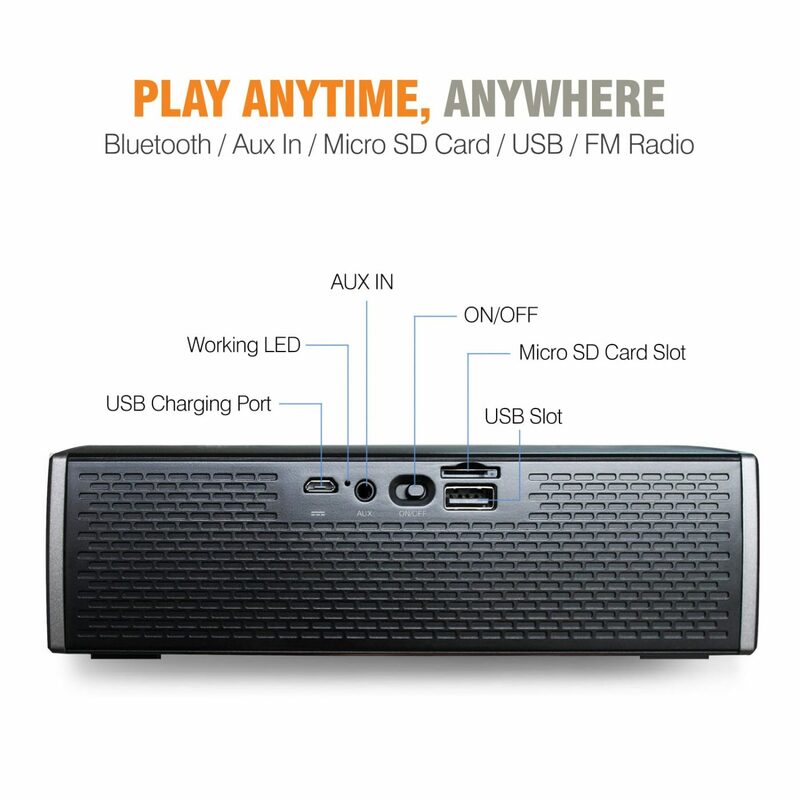 Yes, you can connect it to your PC/Laptop using either Bluetooth or via AUX Cable. Does this support NFC playing? No, BommerFX is not NFC enabled. 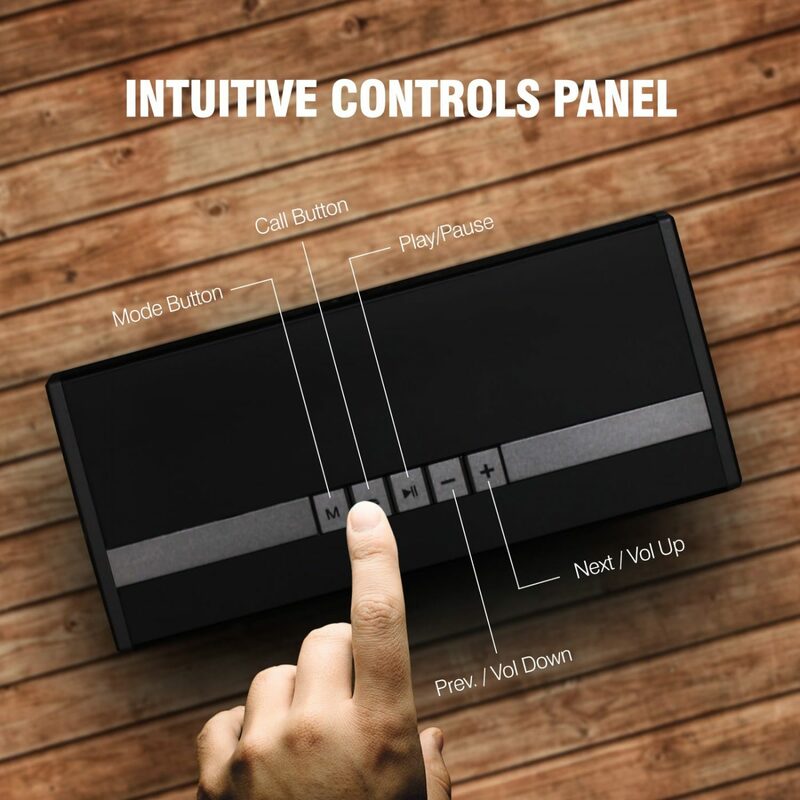 How many devices can be connected to it? 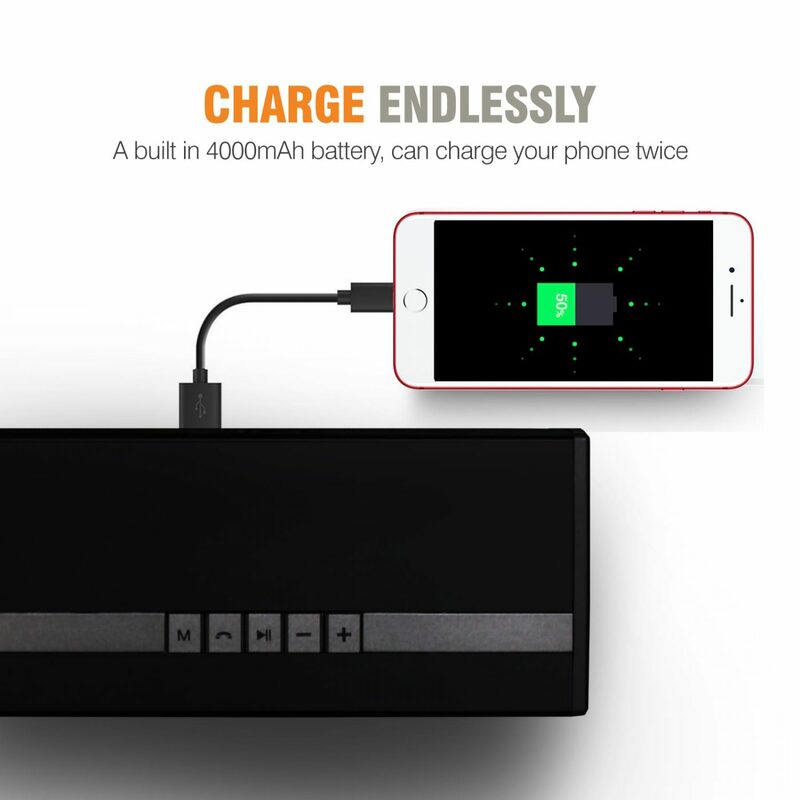 You can connect up to 2 devices at a time. How much time is required to fully charge BoomerFx? It takes approximately 6 hours for BoomerFx to be fully charged. No, BoomerFx is not waterproof. Does it support Music playback using USB ? Yes, it supports Music Playback through USB (upto 32GB only) FAT32 and NTFS. Is this a Mono or a Stereo Speaker? It’s a Stereo speaker with two 6W driver (6W X 2) and one Passive radiator for Bass.